Before talking about martial arts school contracts, and California’s Health Studio Services Contract Law, I want you to know something. Frank Bloksberg Sensei is a lawyer and writes about martial art contract law. My name is Frank Bloksberg. I am Chief Instructor of Aikido’Ka. I am also a lawyer. Nothing I say here is legal advice, just general rules. If you want legal advice, go hire a lawyer! You can contact me, if you’d like. But I do charge for my time. I won’t be giving legal advice in the comments. The “End Notes” in this article are to California laws which together are known as California’s Health Studio Services Contract Law. You can search for those laws and read exactly what the law says. The symbol before the law number — § — means “section.” Two of the symbols — §§ — means “sections.” So, Civil Code §1812.81 means California Civil Code section 1812.81. Civil Code §§ 1812.80-1812.97 means California Civil Code sections 1812.80 through and including 1812.97. California Law Provides Great Consumer Protection. These laws exist to protect you. Let’s put it this way . . . Are you wondering how to get out of your martial arts contract? In California, this is the law you’ll probably use. And you’ll probably find your answer in this article. Even so, this article really is just an overview. Some exceptions apply which I am not going to discuss here, because they’re really uncommon. OK. On with our talk about martial arts contracts. 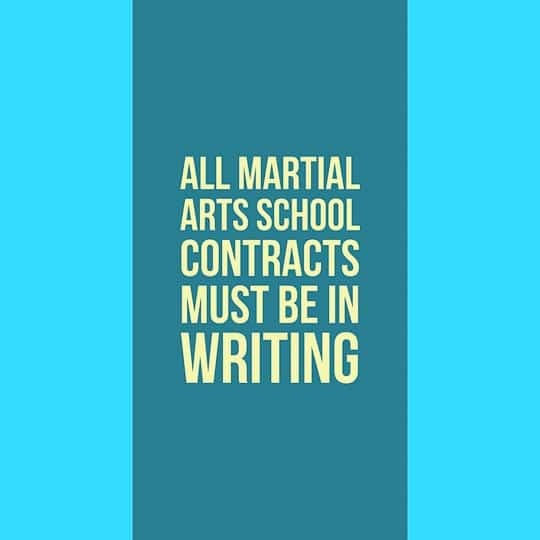 . .
All martial arts school contracts must be in writing. That means that a four-year agreement would be unlawful. A two-year contract requiring payments for longer than two years also would be unlawful. It also means that “lifetime contracts” are now allowed. 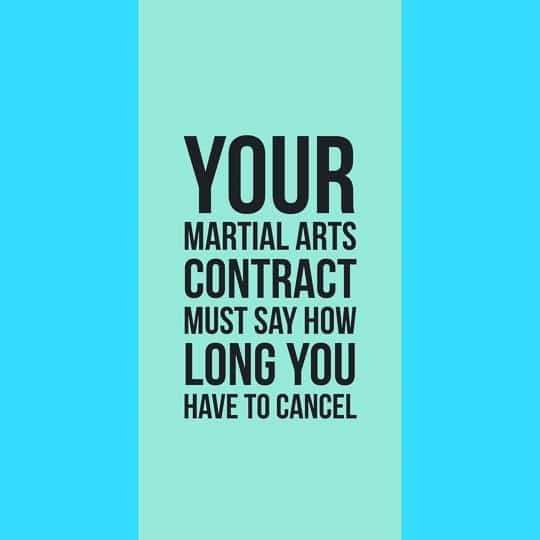 Your Martial Arts Contract Must Say How Long You Have to Cancel. You may cancel the martial arts contract at any time before midnight of the fifth day that the martial arts school is open for business after the date you sign. Don’t count Sundays and holidays when counting the five days. For instance, if you sign the agreement on Monday, you must cancel it by mailing or delivering notice to the address specified in the contract anytime until midnight on Saturday. 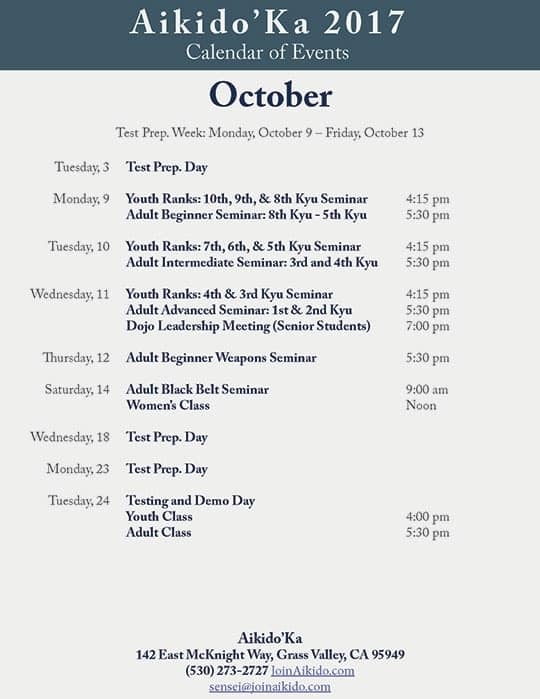 If the dojo were not open for business on Tuesday, the time for canceling would be extended until midnight on Monday. If you signed on Saturday, you don’t count Sunday (even if the martial arts school were open Sunday), meaning that you could cancel by mailing or delivering notice anytime before midnight on Friday. 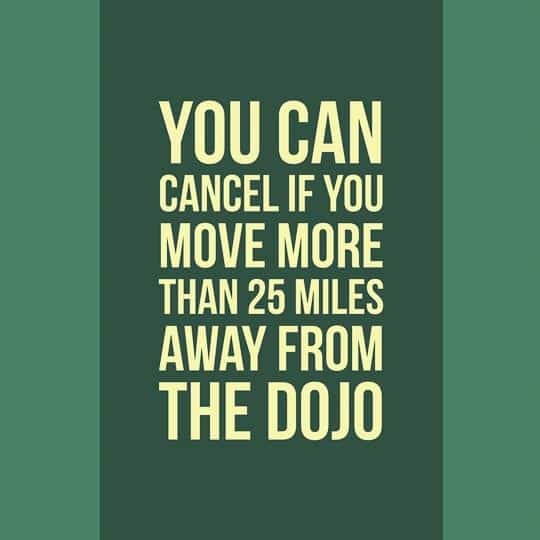 If the facilities or services at the dojo are eliminated or substantially reduced for more than a temporary time due to reasonable repairs or improvements, you can cancel at any time. It’s hard to know exactly what this means for a dojo when it comes to facilities. For a health club, if they eliminated a pool or tennis courts, that would probably count. Whatever the facility changes are, they must be substantial. Of course, if the martial arts school dropped a substantial number of classes, then you could cancel the dojo agreement. 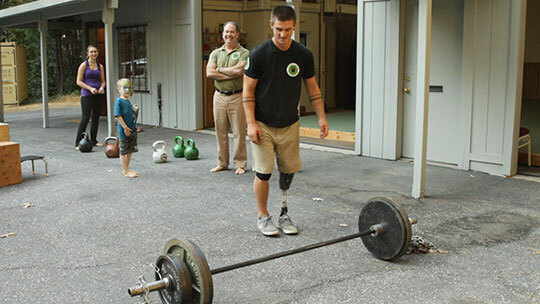 You Can Cancel Your Martial Arts School Contract if You Move or Can’t Train. 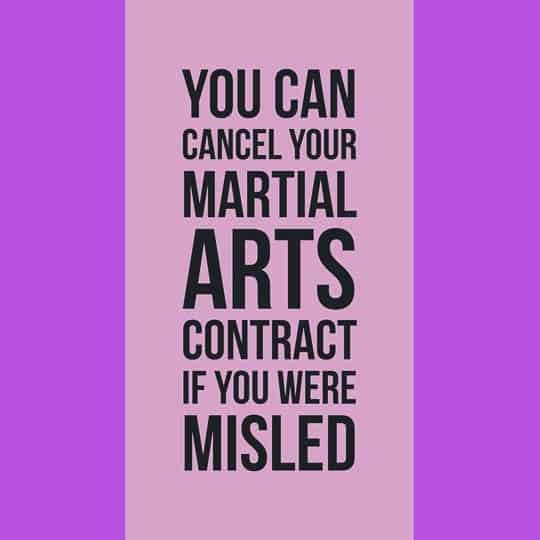 You Can Cancel Your Martial Arts Contract if the School Commits a Serious Violation of the Law, Including Misleading You. 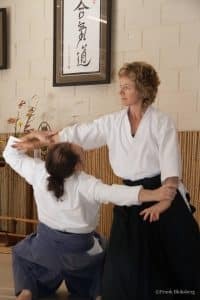 For instance, if the martial arts academy knows or has reason to believe that a significant portion of the services or facilities will not be provided or available for you to use as promised, or if the martial arts school misrepresents anything else that is important to you, that may entitle you to cancel. 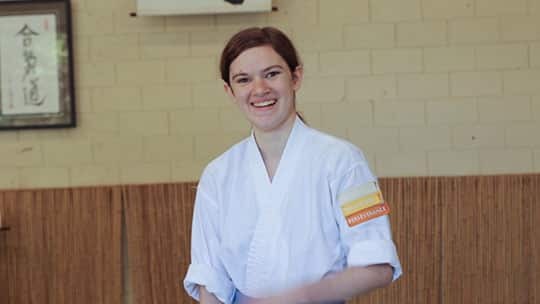 If you decide to cancel because of the martial arts schools misconduct, you should give written notice of cancellation promptly after you learn of your right to cancel. The notice should describe the willfully false or misleading information. Watch Out for Financing Agencies and Factoring! You need to learn how factoring and selling martial arts contracts can affect you, before you sign anything! This is really important. Any claim that you waived any rights provided by this law is void and unenforceable.31 That means that the requirements of these laws always apply. Don’t Sign Anything Without Reading it Thoroughly and Understanding It! If you can’t understand what you’re reading, don’t be pressured into signing. Say no until you understand it. Have someone you trust — preferably your lawyer — explain to you what it means. 1. California’s Health Studio Services Contract Law — Civil Code §§ 1812.80-1812.97; Civil Code § 1812.82. 4. Civil Code §§ 1812.86, 1812.83. 5. Civil Code §§1812.84. See also Civil Code § 1812.83. 7. Civil Code § 1812.85(b)(2). 12. Civil Code §§1812.85(b)(1), (5). 21. Civil Code §§1812.89(a)(1), (2), (4). 24. Civil Code §§1812.85(b)(3) and 1812.91. 25. Civil Code § 1812.90. 29. Civil Code §§1812.87 and 1812.88. California’s Health Studio Services Contract Law has helped a lot of people get out of bad martial arts school contracts. To keep yourself safe from unfair martial arts contract, read the agreement carefully before signing. It would be a good idea to speak to speak with a lawyer before signing any agreement to make payments for a long time!